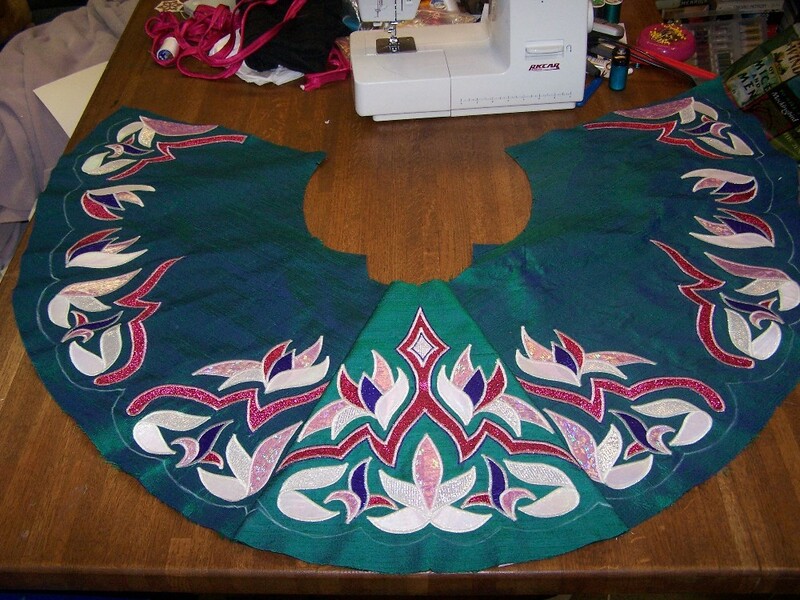 I have promised Susan that I would take pictures of the construction of a dress. 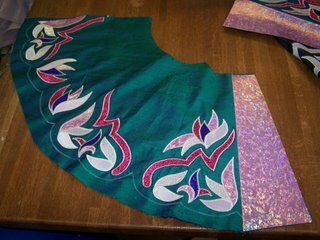 And today on dance.net someone was asking for pics of the skirt to better understand how it is constructed. So I will try. First thing to remember about the Feisdress skirt is that there are only 3 seams (not counting the waist or hem) – the back seam and the two pleat seams. 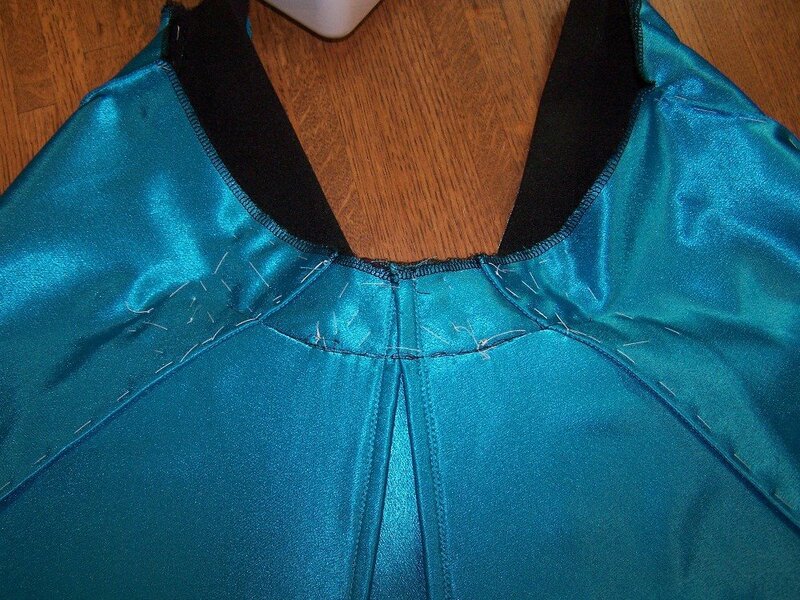 The front pleats are integrated into the CFP (center front panel) and the FSP (front side panel) pattern pieces. My photos show a knife pleat. I attach the color into the pleats by 1)fusing wonder under (or an equivalent) to the flash pleat color (cut out using the appropriate flash pleat pattern piece); 2) sewing the flash pleat onto the base fabric (sewing line is marked on pattern piece); and then 3) pressing/fusing the flash pleat into place ( I also then top stitch next to the seam). 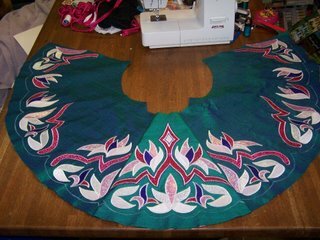 Above is the CFP with front halves of the flash pleats in place. 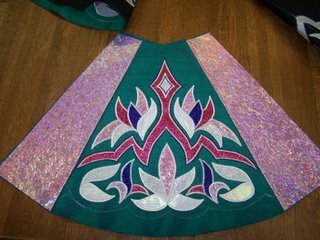 This next picture also shows the flash pleat in place but it also shows the whole right side/back skirt. Perhaps this is where some folks get confused? There are 3 main pattern pieces needed for this portion of the skirt, but they are put together before cutting to create the correct size skirt – there are no seams in the base fabric at this point. 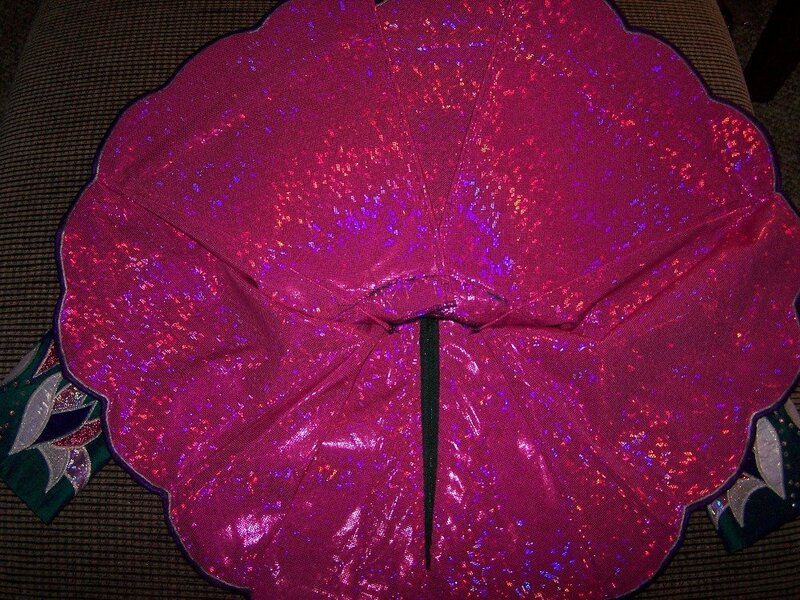 I have used the FSP, tuck and back skirt pattern pieces together to make 1 pattern piece that I then use to cut. This shows the skirt lined up when I checked my flash pleat alignment. Of course I still need to attach the skirt lining and stiffener, but to create the whole skirt, I sew the flash pleats together and then bind them with the lining which can be made out here (This is the inside of a different dress.) This also shows my messy basting of the tucks which I will discuss in a moment. 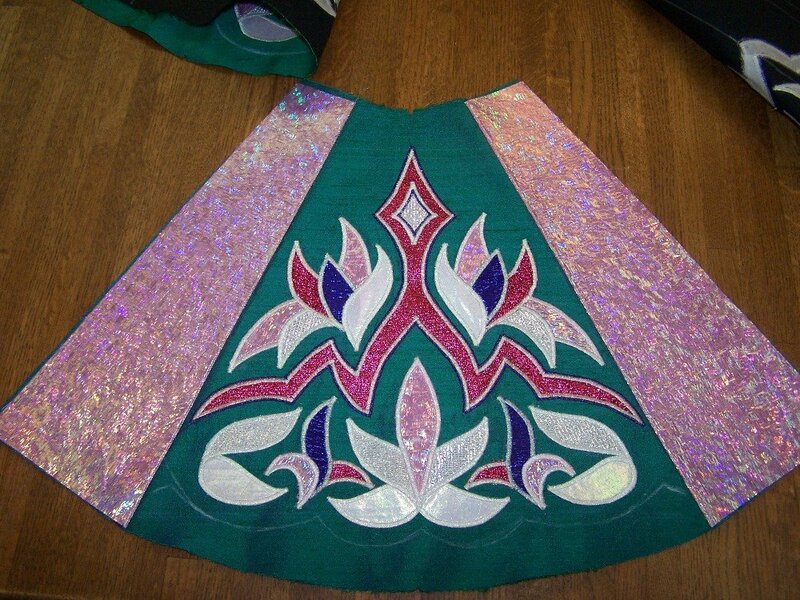 Here is a pic of the finished lining for the green skirt. Things are a bit hard to make out, but the bound pleats are at the top of the photo, the folded tucks are at the side, and the back seam and zipper are beneath the lining at the bottom. As for basting…I made one using the Feisdress pattern without basting. Dumb move. I fussed and fussed, ripped out and started over way too many times. Susan says in her directions that if you press and baste as you go along, all will be well and it is true. It helps immensely when sewing the skirt on because the skirt waist is already the size it should…no extra pinning to fit pleats in. And the pressing is already done! Ultimately it is a time and sanity saver.